Choosing three senior figures – John Kerry for State, John Brennan for the CIA, and Chuck Hagel for Defense – who range from clueless to hostile about Israel. Approving a huge gift of advanced weapons - 20 F-16 fighter jets and 200 M1A1 Abrams tanks - to the Islamist government in Egypt despite the fact that its president, Mohamed Morsi, has becoming increasingly despotic and calls Jews "blood-suckers, … warmongers, the descendants of apes and pigs." Reiterating the patronizing 35-year old tactic relied upon by anti-Israel types to condemn Israeli policies while pretending to be concerned for the country's welfare: "Israel doesn't know what its own best interests are." Ignoring evidence of Cairo importing Scud missile parts from North Korea. Rebuffing the 239 House members who called for closing the PLO office in Washington in response to the PLO's drive for state-observer status at the United Nations. 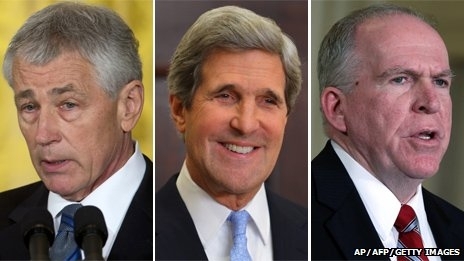 The three nominees – Chuck Hagel, John Kerry, John Brennan. Asked about Obama's nomination of Hagel, Ed Koch, the former New York City mayor who, despite his astringent criticism of Obama nonetheless endorsed him for re-election, offered an astonishing response: "I thought that there would come a time when [Obama] would renege on … his support of Israel [but this] comes a little earlier than I thought." Even Obama's pro-Israel supporters expected him to turn against the Jewish state! 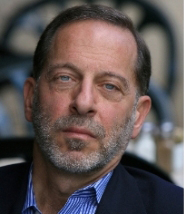 Rashid Khalidi, former PLO functionary, then Obama pal. A picture from 1998 shows him listening reverentially to anti-Israel theorist Edward Said. 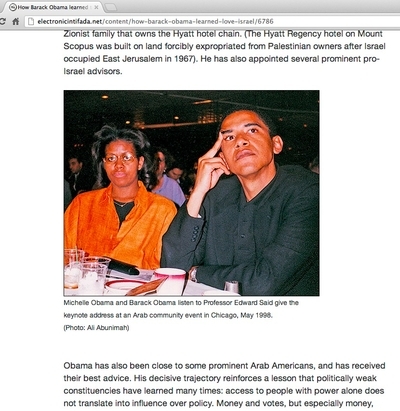 Obama sat idly by as speakers at an event in 2003 celebrating Rashid Khalidi, a former PLO public relations operative, accused Israel of waging a terrorist campaign against Palestinians and compared "Zionist settlers on the West Bank" to Osama bin Laden. Ali Abunimah, an anti-Israel agitator, commended Obama in 2004 for "his call for an even-handed approach to the Palestinian-Israeli conflict," code words for distancing the U.S. government from Israel. In turn, Obama praised Abunimah for his obsessively anti-Israel articles in the Chicago Tribune, urging him to "Keep up the good work!" Abunimah also reveals that, starting in 2002, Obama toned down his anti-Israel rhetoric "as he planned his move from small time Illinois politics to the national scene" and Obama made this explicit two years later, apologizing to Abunimah: "Hey, I'm sorry I haven't said more about Palestine right now, but we are in a tough primary race. I'm hoping when things calm down I can be more up front." And Obama dutifully made the requisite policy changes, if in a cramped and reluctant manner ("I have to deal with him every day" he whined about Israeli prime minister Binyamin Netanyahu). He supported Israel in its 2008-09 and 2012 wars with Hamas. His administration called the Goldstone Report "deeply flawed" and backed Israel at the United Nations with lobbying efforts, votes, and vetoes. Armaments flowed. The Israeli exception to the Nuclear Non-Proliferation Treaty remained in place. 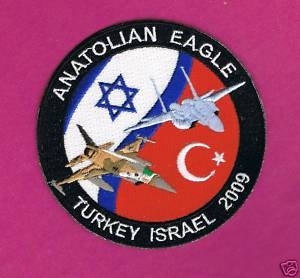 When Ankara canceled Israeli participation in the 2009 "Anatolian Eagle" air force exercise, the U.S. government pulled out in solidarity. If Obama created crises over Israeli housing starts, he eventually allowed these to simmer down. A joint exercise patch for an exercise that never took place, available now on eBay for US$9.99. Returning to the present: Netanyahu's likely re-election as Israeli prime minister this week will mean continuity of leadership in both countries. But that does not imply continuity in U.S.-Israel relations; Obama, freed from re-election constraints, can finally express his early anti-Zionist views after a decade of political positioning. Watch for a markedly worse tone from the second Obama administration toward the third Netanyahu government. Recalling what Obama said privately in March 2012 to the then-Russian president, Dmitry Medvedev ("This is my last election and after my election, I have more flexibility"), there is every reason to think that, having won that re-election, things have now "calmed down" and, after a decade of caution, he can "be more up front" to advance the Palestinian cause against Israel. I also predicted in September that "Israel's troubles will really begin" should Obama win a second term. These have begun; Jerusalem, brace for a rough four years.